Spinal decompression is a treatment in which forces are applied to the spine in order to maximize spinal elongation. In order to accomplish this, the paraspinal muscles, the muscles which protect the spine from injury, are relaxed, enabling your chiropractor to apply spinal decompressive forces to spread the vertebrae of the spine. Spinal decompression can be very effective at relieving pressure on nerves and intervertebral discs, facilitating the movement of spinal fluid. At Westport Chiropractic and Acupuncture, we utilize a lumbar spinal decompression machine and a cervical spinal decompression machine to perform the treatment. These are machines that incorporate high-speed treatment computers that calculate the spinal decompression treatment curve for each individual patient, ensuring that every patient receives the detailed, expert care that they need. If you spend a considerable amount of time sitting or lifting objects, you may experience pain in your lumbar spine, or lower back. Lower back pain sufferers may find relief through lumbar decompression. Using a computer controlled decompression table, our Westport chiropractors focus on lengthening the spine to decompress the discs and ease pressure on pinched nerves. By lengthening the spine, a negative space is created within the discs, which allows fluids, nutrients, and bulging disc tissue to move into the space between the vertebrae. This decompression takes pressure off the spinal nerves, which can greatly reduce pain and increase functioning. As you lie back on our padded treatment table, you will be fitted with a harness around your hips and your torso to hold you gently in place during treatment. Each patient is treated with a customized treatment protocol to ensure they receive the optimal benefits from treatment. 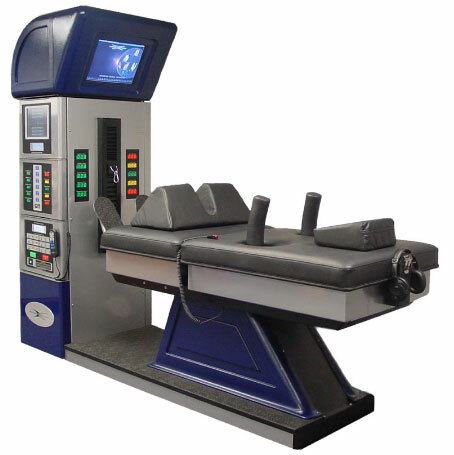 Our lumbar spinal decompression machine, also called the NSSD, uses cutting-edge technology to accurately and efficiently calculate the necessary motion needed to obtain the best possible results. Lumbar decompression treatments typically take 20 to 30 minutes. Neck, upper back, and shoulder pain and stiffness can significantly impact your life, and make it difficult to enjoy activities you once did. Your cervical spine can affect much of your upper body, since your cervical nerves are responsible for carrying signals throughout your hands, arms, shoulders, upper body, diaphragm, head, and neck. Cervical decompression lengthens the cervical spine to remove pressure from the numerous nerves that travel through that area. Our cervical decompression machine uses a comfortable headrest and cutting-edge treatment computers to achieve just the right amount of treatment motion for your anatomy. Every patient receives a slightly different treatment, which is calculated by our computers. Depending on your body’s needs and response our state of the art treatment program will make adjustments as frequently as required to ensure that your treatment is as effective and comfortable as possible. If, after speaking with our Westport chiropractor, spinal decompression treatment is recommended, our friendly, knowledgeable team will help you schedule your treatment sessions. Because every patient is different, the number and frequency of your visits will vary, and our spinal decompression chiropractor will ensure that you receive treatment that is tailored to your specific needs. At Westport Chiropractic and Acupuncture, we believe there is no greater calling than to serve, and we are committed to putting our patients and their needs first. Contact us today at (203) 779-6113 and schedule your complimentary consultation for your spinal decompression in Westport.